The cost of specialty drugs, injectable or tablet form used to treat complex medical conditions, is growing at an annual rate of over 20 percent. At current utilization rates, the cost of new and existing specialty drugs is predicted to total 40 percent of the cost of providing pharmacy benefits to employees and their dependents by 2016. These statistics are a composite of data from ESI, Caremark, Optum, and Medco reports. In addition to market factors driving overall cost increases, the absence of generic substitutes and brand-name competition gives drug manufacturers near-monopoly pricing power and makes conventional benefit design and utilization management less effective than when applied to traditional brands and generics. As plan sponsors explore options to better manage the cost of specialty drugs as part of employee health benefits, beware of nuances that only health care professionals are apt to understand. Many plan sponsors have increased member co-pays for specialty drugs to help rein in costs, but studies have shown that excess co-pays also lead to non-adherence by plan members. Non-adherence subsequently increases potential hospital admissions and corresponding medical costs. With the average new specialty drug costing in excess of $80,000 per year, it is impossible to proportionately share the cost of these drugs between the plan member and the plan sponsor, so new strategies must be developed that go beyond member co-pays or co-insurance. Utilization management has historically focused on prior authorizations and quantity limits on conventional brand and generic drugs rather than step therapies. In the last two years, the emergence of more specialty medications has created step therapy opportunities in 10 categories of specialty medications. As a result, the applicability of traditional utilization management has increased. However, there are still numerous challenges. Unlike conventional drugs, a substantial share of specialty drugs is administered by doctors and hospitals and therefore, covered under the medical benefit rather than the pharmacy benefit. This creates cost and utilization challenges as medical providers will typically mark up the cost substantially and re-bill the plan. Mark-ups can be as much as 10 times the cost of the drug. The challenges of covering specialty drugs under the medical benefit − high drug mark-ups by physicians, less utilization data, less control for health plan administrators and employers − have led to attempts to integrate medical and pharmacy benefits, but such efforts are still in early development and subject to resistance by providers, especially oncologists. As a result of increasing costs, health plan administrators are experimenting with a range of innovations to control spending. However, the most meaningful wide-ranging changes may not be feasible until substitutes, such as biosimilars and generic specialty medications, become widely available. That is unlikely to occur for many years because of an agreement between the Obama administration and the pharmaceutical manufacturers which ensures that current specialty brands receive 12 years of patent protection. Additionally, the FDA approval process for generics is loaded with difficult terms and conditions for any generic manufacturer challenging a brand specialty drug. All of the factors above contribute to the rising cost of specialty drugs and a growing concern by employers who provide them as a benefit. Spending on specialty drugs is estimated to rise dramatically over the next four years as 700 specialty drugs, currently in development, come on the market. While specialty drugs are prescribed for only one in every 100 active health plan enrollees, they account for an estimated 12 percent to 16 percent of commercial prescription drug spending today. The current monthly spend per patient for a specialty drug, generally, exceeds $2,000. For common-used brand and generic drugs, Pharmacy Benefit Managers (PBMs) either select or exclude numerous drugs from their preferred formularies. One of the challenges in managing utilization of specialty drugs is that they are rarely excluded from PBM formularies so the use of “preferred” and “non-preferred” drug tiers to control the member selection process is not in place. Once a new specialty drug is approved by the Food and Drug Administration (FDA), its addition to a PBM’s formulary is almost automatic. Each PBM has a Pharmacy & Therapeutics (P&T) Committee whose drug reviews focus on ensuring safe and appropriate use and preventing off-label use rather than restricting access because of cost. The rare exceptions are in the few specialty drug classes where numerous substitutes exist, for instance, the growth hormone therapeutic class. For specialty drugs covered under the pharmacy benefit, some employers choose to transfer a portion of the high costs to patients by adding an even higher cost-sharing tier to the standard three-tier pharmacy benefit design. Within the fourth tier, some plan sponsors retain a degree of financial protection for members by applying out-of-pocket maximums of $100-$250 per prescription fill, or a maximum of $2,500-$5,000 annually. For specialty drugs covered under the pharmacy benefit, plan sponsors turn to PBMs, all of whom have either acquired or developed their own specialty pharmacy divisions or have contracted with independent specialty pharmacies to negotiate unit prices on their behalf. As you might expect, larger PBMs leverage their high volume orders to receive the deepest discounts from drug manufacturers. Specialty drugs covered under the pharmacy benefit are subject to more invasive and stringent utilization management than those under the medical benefit. Clinical prior authorizations are widely practiced under the pharmacy benefit but are far less prevalent under the medical benefit, where retrospective review remains more common. At the current time, specialty drugs under the medical benefit are subject to prior authorizations about five percent of the time. A major reason for this difference is that most contracts between health plans and medical providers contain no provisions for clinical prior authorization or other utilization management protocols for specialty drugs under the medical benefit. Plans are concerned that by adding a prior authorization provision, providers will resist and subsequently refuse to be a network provider. This is especially true of oncologists. Strong clinical care management is critical to promoting both good health outcomes and cost containment. Key challenges include: (1) ill patients with complex chronic conditions requiring complicated drug regimens; (2) the need to adjust drugs in a therapeutic class or finely-tuned drug dosages; and (3) management of strong side effects or depression that can cause patients to abandon their drug regimens. Cancer and hepatitis C are two disease states in which medications cause such unpleasant, sustained reactions that keeping patients compliant over time is particularly difficult. That creates the need for a “high-touch” approach to care management, where the PBM staff not only has clinical expertise but also the ability to “form personal connections with patients” that motivate them to follow demanding drug regimens. Some of the most effective care models include depression screenings and referral to behavioral specialists. Takeaway #1 – Key drug management strategies that have proven effective for conventional drugs often are less applicable to specialty drugs. 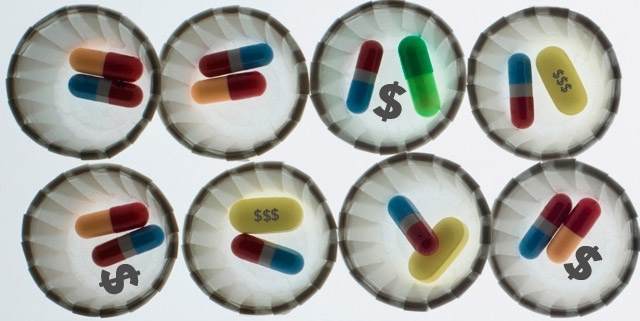 The lack of close substitutes for most specialty drugs greatly reduces or eliminates techniques, such as cost-sharing tiers and step therapy, to steer patients and providers toward cost-effective alternatives. It also sharply limits incentives for drug manufacturers to offer substantial price concessions and rebates. In contrast, prior clinical authorizations and quantity limits, which help curb unnecessary or inappropriate use, improve patient safety and adherence, and reduce waste, are essential in effectively managing the use of specialty drugs. Takeaway #2 – Biosimilars (generics) are expected to lead to key breakthroughs in specialty drug management, but their impact won’t be seen for many years. The introduction of generic substitutes will allow payers to broaden use of preferred drug tiers and step therapy, thereby exerting downward pressure on prices. However, assessing and achieving therapeutic equivalence is likely to be difficult, given the complex nature of biologics. In addition, expensive manufacturing of specialty drugs means that biosimilars may not yield savings as sizable as those achieved by conventional generic drugs. It will be years before biosimilars can affect competition and cost. Currently, brands are granted a minimum 12 years of market exclusivity, and the FDA approval process is expected to be rigorous, lengthy, and skewed in favor of brand manufacturers. Takeaway #3 – Integration of the medical and pharmacy benefits is a goal worth pursuing but how to achieve it isn’t clear. Efforts to overhaul the currently fragmented benefit structure, in which incentives can be misaligned for patients and providers, causing uncoordinated patient management, are in the early stages of development. Results so far are at best uneven. Equalizing patient cost-sharing for specialty drugs, regardless of whether the drug is covered under the pharmacy or medical benefit, is probably the most straightforward part of integration. Other aspects present tougher challenges. For example, real-time integration of utilization data remains hampered by limitations in claims and billing systems. The ability to track utilization and spending under the medical benefit remains limited, which in turn hinders the ability to effectively manage a large segment of specialty drug utilization. Lastly, as office-administered drugs are moved out of the medical benefit’s buy-and-bill approach, medical administrators will have to deal with fallout from physicians who will see this as an erosion of both their profit margins and clinical autonomy. Takeaway #4 – Patient adherence is critical to good health outcomes. PBM pricing and performance guarantees are necessary, but if you can’t keep specialty drug patients compliant, guarantees are of little value. Both high out-of-pocket costs and strong side effects pose formidable barriers to patient adherence and positive health outcomes. A combination of non-punitive cost-sharing and strong care management may reduce those barriers. One benefit design approach to consider that may make the plan member’s financial burden more manageable is an income-based, cost-sharing structure. Another approach would put a fixed dollar cap on co-insurance for specialty medications. Takeaway #5 – Plan sponsors should ensure that the overall benefits of their specialty drug strategies are aligned with their business strategies. Decisions on specialty drug coverage require tough trade-offs between cost and access. The cost-access combination an employer chooses will be heavily influenced by competitive conditions in the industry and the geographic and labor markets where an employer operates. Short-term cost containment can have unintended consequences. For example, increased cost sharing may lead to reduced adherence to drug regimen, which in turn leads to costly medical complications. Such negative impacts most affect employers who have low employee turnover and still offer comprehensive retiree health benefits. They are likely to be paying the bill long- term for patients taking specialty drugs. Cost-benefit comparisons of different drug coverage options will become more accurate as they are able to account for the impact on employee productivity and direct medical costs; however, both are currently difficult and costly to assess and measure. KTP Advisors is a specialty advisory firm on retiree health benefits and active employee pharmacy benefits for corporations, municipalities, Taft-Hartley funds, universities and other institutions. All of the takeaways mentioned in this paper are either currently in place or available to our clients. For additional questions on your pharmacy benefit, please contact John Adler, KTP Pharmacy Benefit Practice Leader, at jadler@ktpadvisors.com or 401 585.4069.